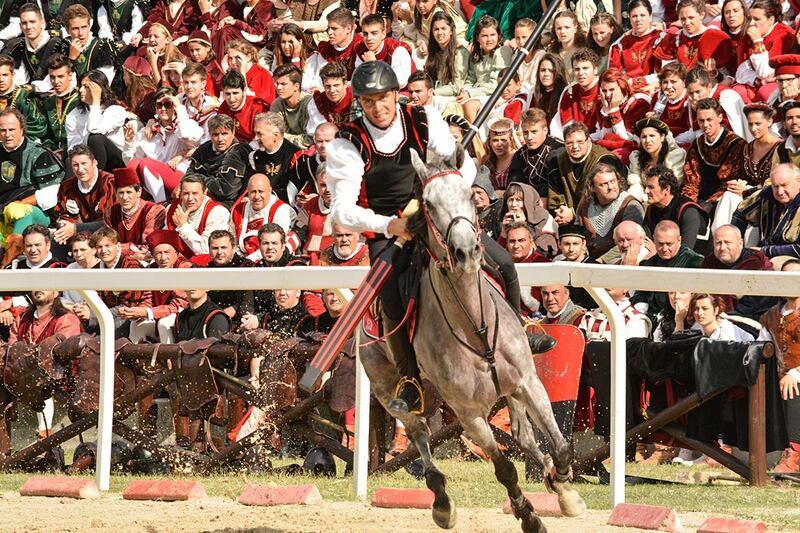 At the “Ponte Majore” stadium, six knights representing the six districts of the city fight on a race competition to ride a horse against the feared “Moro”. Only the fastest and the most precise will win the coveted Palio. The “Ponte Majore” Horse Race Stadium, located between the Forte Malatesta and the San Vittore Church, is the sacred temple of the Quintana. The route is a eight shape path where the six districts fight to win the Palio. 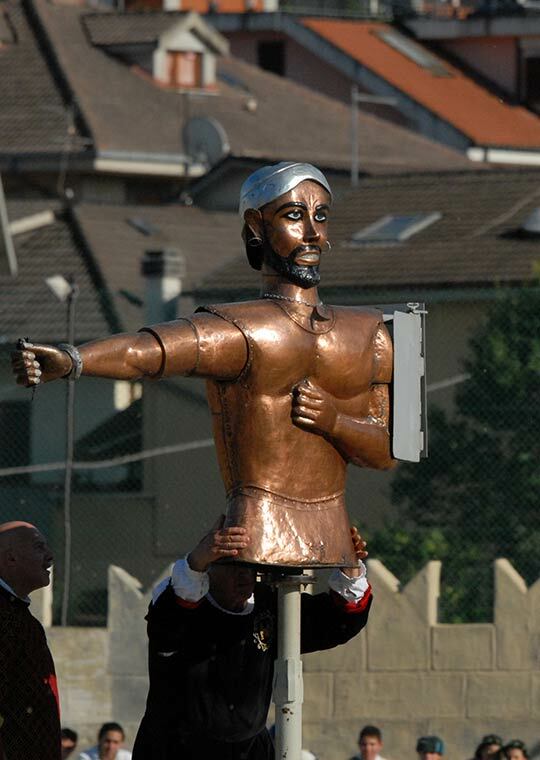 The competition is unique because it’s the only one in the world having a target made of a puppet named “The Dark” ( Il Moro) with a shield on his arm. The Moro is a very challenging target, since the impact that a knight has to face with its spear is very heavy. Each of the six knights has to ride the horse for three different turns (named “tornate”). Each tornata is made of three assaults to the Moro. The final score that determines the winner is a combination of time (each second corresponds to a certain score) and assault results. Conventionally, a knight gets 300 points if he rides in 55 seconds during one of the three turns. There are two more points for each tenth of a second faster and two less points for each tenth of a second slower than 55 seconds. If the knights is slower than 60 seconds he gets no points. The Moro holds a shield with a scoreboard divided into five circular concentric sections with a score that goes from 20 up to 100 (in the exact middle of the scoreboard). The knight has to ride the horse on a 8 shape route bounded by fake red hedges. If a hoof touches 1 hedges, the knight gets 30 points penalty; if two hooves go off the route the turn is considered not valid and the knight gets 0 points. Another big issue is the spear. If the knight breaks it or lose it, his turn is not valid and he gets no points. 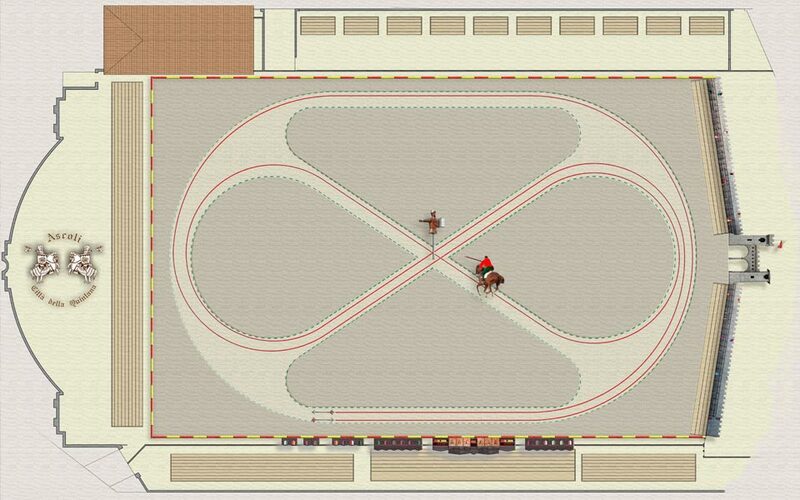 The first two turns of the race are run by the knights according to the drawing which is done the day before the game during the July “Greeting to the Lady of Peace” and the August “Blessing of candles” events. The last and most important turn is run according to the temporary ranking of the first two turns from the last to the first one. At the end of the 3rd turn, the knights that obtained the highest final score (time and preciseness) wins the Palio.